Coffee cake recipes are quick and easy to make for breakfast, snacks or anytime. Coffee cakes aren't really cakes at all, they're a type of quick bread; a bread dough that doesn't contain yeast. Coffee cakes are made by the simple method of mixing the dry ingredients together first, then cutting the cold fat (butter or shortening) into the dry ingredients, and lastly mixing the wet ingredients into the dry. This is also the way that biscuits and most quick breads are made. There are some recipes that call for vegetable oil as the fat-this is supposed to make a more moist and tender coffee cake. Coffee Cakes can benefit from the addition of nuts, raisins, dried fruit, or just about any other sweet things that you like. You can also make a savory coffee cake with the addition of meats, onions, and other vegetables and spices. 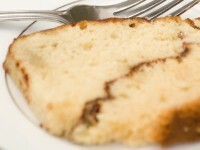 Also, try baking your coffee cake in a muffin pan instead of the traditional round layer cake pan or bundt cake pan. These make a quick breakfast that you can grab on your way out the door in the morning, especially if they have crispy, crumbled bacon or cooked sausage in them. 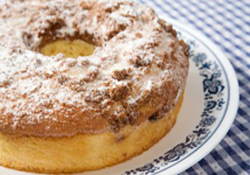 Coffee Cakes can be assembled at night and mixed together the next morning. Just mix all the wet ingredients together in one bowl, and all the dry ingredients together in another bowl. Put this in the fridge overnight and in the morning preheat the oven, mix the two bowls of ingredients together, and pop into the preheated oven. It will be done when your coffee is done brewing! Coffee cake freezes well for about 6 months if tightly wrapped. When thawing, leave the wrapping on it until its all thawed out. This prevents condensation from collecting on the cake as it thaws which can make it sticky and damp on the outside.